Welcome to the September issue of the Hearing Matters blog by the Mild to Moderate Hearing Loss (MMHL) Group at the NIHR Nottingham Biomedical Research Centre. This month we will focus on how behaviour change can inform hearing health care. Our health is affected by many things that can have either a positive or negative effect on our well-being. For example, our hearing health will be affected how much noise we have been exposed to or our family history of hearing loss. Our health behaviour can also affect our health. If we try to change something about our health such as getting more exercise or wearing hearing aids, we call this health behavior change. 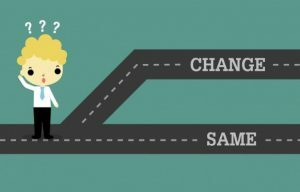 Within audiology, there has been an increasing awareness of the value of using health behaviour change theory to guide research. For example, we used the Self-regulatory model to examine the psycho-social impact of hearing loss. Whilst it has been a positive development, within the field of health psychology it is suggested that various popular models (e.g. Transtheoretical Model, Health Belief Model) do not, and cannot reliably, explain variability in health behaviour. A new model focuses on understanding how health behaviours change, and what we can do to make better plans to manage our health, COM-B Model. There are three essential ingredients necessary for any behaviour to occur. Capability is the skill and knowledge necessary to make an action to occur. 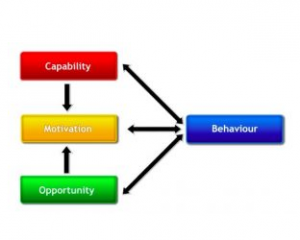 Opportunity is an environment where a behaviour can happen. Motivation is an individual’s drive to do something that is influenced by their values and goals. We use this COM-B model to guide some of our MMHL research. For example, poor knowledge about how hearing aids work can cause to difficulties using hearing aids, leading to non-use of hearing aids. To help improve knowledge for hearing aid users, we have developed videos (C2Hear Online) that have been shown to mainly improve capability but also opportunity and motivation. A randomised controlled trial showed the benefits in improved knowledge, hearing aid handling skills as well as hearing aid use. We have used the COM-B to guide the development of a more interactive and individualised version of C2Hear, which we call m2Hear. This is currently being trialled in new hearing aid users, but preliminary results look very positive at m2Hear helping improve hearing health behaviours. 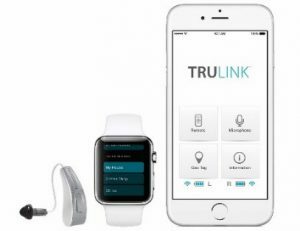 Recently we looked at the how useful smart-phone connected listening devices would be for people living with hearing loss. One of the interesting findings was that people said that since smart phones are everywhere, listening devices that connect to these phones would provide greater opportunity for people to use amplified sound. People in the study also said that smart phone devices could be easily adjusted which would provide greater motivation to use them. This information is helpful in understanding the challenges faced by people living with hearing loss. The COM-B model underpins some of the research in the MMHL team because it guides how we can develop and evaluate complex interventions to address the effects of hearing loss. It also shows that behaviours of persons with hearing loss do not exist alone, but are part of a broader, complex system. If you would like to read a bit more on this idea, see the links within the article.